DatingAdvice.com: Are They Truly Experts They Claim To Be? DatingAdvice.com: Are They Truly Experts They Claim To Be? I’ve been following strictly hookups industry sites. But, from time to time, a mixed site shows up and I take my time to find out more, especially if it’s good looking. I did this DatingAdvice.com review to capture the ranking for hookup apps. Among the variety of texts and opinions, hookup websites have decent attention and following. Therefore, I took my time around the site, in particular with the section that interested me the most. Let’s look into the site stats about the best hookup apps below. But first, what else is there on DatingAdvice.com? This website is focused mainly on providing advice to solve all problems dating. In fact, 90 percent of the articles are about some problem in dating, be it breakups, niche dating, or open relationships. And yes, advisors are about specific niche dating, so you can find everything from hookups to Christian dating. I didn’t pay much attention to gay and lesbian resources, but there is a lot to read about if you are interested in that. The reviews are organized in sections for niche dating, so you won’t get lost in an uncomfortable area if you are not up for it. If you are all about numbers and statistics, you can find some pretty amazing stuff in this section that is regularly updated. You can learn a lot about how people act on dating sites. However, most of the studies are not focused on casual dating. Although you can find interesting data about hookups, the majority of texts is pretty mainstream. I found these articles pretty appealing to read, so you might want to check them out: “Study: These 10 Cities Search Tinder the Most” and “51% of Adults 18-23 Not Morally Opposed to Open Relationships”. The 250 experts are male and female dating coaches on all things dating. You can get personally in touch with most of them and schedule a coaching session. I don’t recommend spending money on dating coaching before you try some of the adult dating sites that guarantee success. They are much cheaper and definitely more fun than having an “expert” listen to your personal problems without any real-life action. The forum is active, but the problem is it’s not easy to get access to it. The other two sections keep up-to-date with all the latest online dating resources. Now, let’s focus on our key area of interest – hookups. As you can see, the AFF group is again given priority. 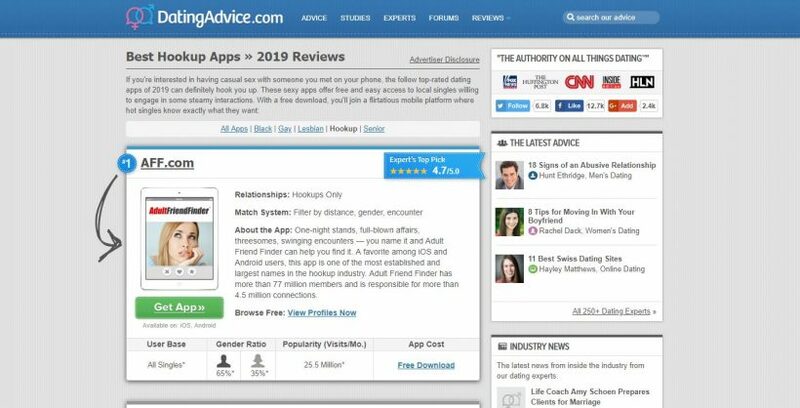 Aside from the top 3 hookup apps, the DatingAdvice.com review board includes sites like MenNation and Lesbian Personals. DatingAdvice.com has some interesting content and is fun to be around. However, if you are exclusively interested in hookup apps and casual dates, this will be a frugal resource. Many of the best adult dating sites are not there. The information about hooking up is minimal so you’ll have to look for more details elsewhere. The site is unique for its study orientation and the army of dating coaches. If you like to take a more in-depth approach to find NSA dates, I guess it’s worth dedicating 10-15 minutes to it. For more resources and updates, return to the main page.